Ras Leon Saul making a case for the decriminalization of marijuana at the Guyana sitting of the Caricom Marijuana Commission. 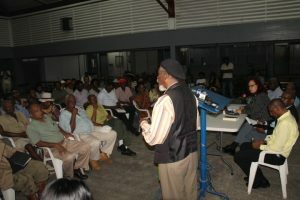 The Commission of Inquiry into the 2015 fiery disturbances at the Georgetown Prison that killed 17 prisoner has recommended that no one should be jailed for possession of drugs including small amounts of marijuana for personal use, but Attorney General and Minister of Legal Affairs, Basil Williams said Cabinet has not yet considered that aspect of the report. The Report of the Commission of Inquiry into the Camp Street Prison Disturbances and Resultant Deaths on March 2 to 4, 2016 has recommended that judiciary, magistracy and legal sector “decriminalize possession of minimum amounts of marijuana for personal use”. Concerns have been raised about the overcrowding of Guyana’s prisons mainly due to the high number of persons convicted and on remand for possession of small amounts of marijuana. 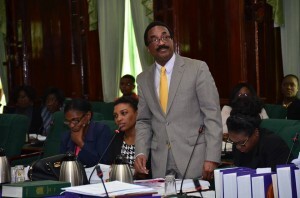 However, Williams told reporters that while Cabinet has considered that report on the jail disturbances, it has not dealt with that specific recommendation for the decriminalisation of marijuana for personal use. “It is not a cabinet recommendation”, but he refused to be drawn into any conclusion about whether that recommendation was acceptable. He declined to offer his individual thoughts on decriminalizing small amounts of marijuana because Cabinet has not yet discussed the issue. The Attorney General said that report was among several other Commissions of Inquiry report that had been discussed by Cabinet at different levels. “There are many things that Cabinet would have to discuss and the salient points would have been discussed in all of those reports…,” he said, adding that “we didn’t” discuss the recommendation for decriminalization of small amounts of marijuana. Government back-bencher, Michael Carrington earlier this week told a Caribbean Community (CARICOM) Marijuana Commission that he has had to face a “brick wall” since tabling legislation more than two years ago for the scrapping of imprisonment for small amounts of marijuana. Asked whether he had ever smoked marijuana, the Attorney General and Minister of Legal Affairs said,” I did study at UWI (University of the West Indies) and I can’t say I recollect taking any drugs”. He described the question as “strange”, adding that he does not drink much alcohol either. The Report of the Commission of Inquiry into the Camp Street Prison Disturbances and Resultant Deaths further recommended the establishment and expansion of those charged with low-level drug offences and ensure proportionality in sentencing by distinguishing between drug trafficking and other types of crime; low, medium and high-level drug offences; rank or position of the accused in drug-trafficking networks, and violent and non-violent offences. The Report further recommends that law enforcement efforts should be reoriented to “target high-level drug trafficking networks, rather than those at the bottom rung of the drug trafficking ladder such as consumers, small-scale farmers, low-level dealers and mules”. Members of Guyana’s Rastafarian community earlier this week lobbied the Caribbean Community (Caricom) Marijuana Commission to recommend the decriminalisation of marijuana of not less than 56 grammes for personal use.